Think of your favorite brands—the businesses you go back to again and again. Yes, they likely have an excellent product or service. But the companies that attract new customers and retain their old ones go above and beyond physical services or products. They provide an experience for their customers, and that experience begins with the first touch or connection a customer has with that brand. It begins when a customer first sees the logo. While we’re told not to judge a book by its cover, we almost always do. Think of your logo as the cover of your book. What image does it bring to mind? Does your “cover” make your customers want to keep reading, or do they pass right by you with nothing more than a yawn? An outdated or unattractive brand identity can lead customers to think the worst. They may get the impression that your company is unprofessional, out of touch, or conversely, new and inexperienced. This is why it is essential to get a custom logo designed for your business—not a logo that your secretary, neighbor, or friend designs. A custom-designed logo is an image you can use on every piece of business material. This includes your website, business cards, social media profiles, emails, invoices, fundraising letters, event invitations, and more. It ties all of these forms of communication together so that customers have a consistent experience each time they interact with your company. After years of being in business, it’s not uncommon for a company to lose their edge in the market. A new, custom-designed logo can breathe life into any marketing campaign, re-energizing the brand and making it more relevant and interesting to customers. A rebranded logo can also build momentum for your business and engage and inspire complacent staff who may have lost their creative spark. There are few things less inspiring than a company logo that was created with Microsoft Word or Clipart. These logos, and logos created by amateurs, stir up questions in customers’ minds. Is this company experienced? Is it stable and profitable? A poorly designed logo indicates a poorly established business. 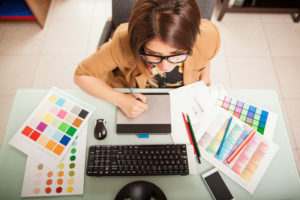 On the other hand, a professional graphic designer can help develop a logo that projects legitimacy and builds confidence. When customers trust you, they buy from you. Your logo is often the first contact consumers will have with your organization, and they will likely make a snap judgment that may stay with them forever. If that judgment is negative, it might discourage them from ever doing business with you. While a bad logo may not always cause such an extreme reaction, it could be just enough to cause potential customer to go with a competitor. With a custom-designed logo, you can start off on the right foot and convey a professional, modern image of your business. Consumers better remember images they see than words they read or hear. A logo will put you at the forefront of a customer’s mind. When they think of a product or service that you offer, they will think of your logo—and vice versa. More importantly, a custom-designed logo will ensure a positive association. Rather than remembering your organization for an embarrassing or outdated logo, they will think of you as cutting edge and at the top of your field. One of the toughest battles every organization must fight is the fight against competitors. With a more globalized market and ever-increasing competition, it has become increasingly difficult for businesses to stand out and differentiate themselves from other businesses in their industry. While providing excellent service and top-notch products goes a long way, there are still plenty of other business that can keep up, provide the same product or service, and sometimes even outpace you. A custom-designed logo will set your business apart from the rest and give you a competitive edge. An organization’s name usually offers little or no information about what it actually does. A custom-designed logo can eliminate confusion and ambiguity, which can significantly impact the success of any organization. And even if your name does let customers know what you do, a professional logo will add personality and help them get a better sense of who you are as a brand. If your organization has been around for awhile, you probably have an established customer base, which is extremely valuable. However, you may have a hard time standing out to new customers who are not familiar with your brand. A custom-designed logo changes everything. It can grab the attention of a totally different market and draw in new customers—who eventually grow your base of loyal repeat customers. In a crowded market, it can be difficult to drown out the noise and create the best possible impression on your audience. A professional graphic designer can guide you in the right direction and help you stand out. They can develop a new logo that is attractive and exciting to customers, re-energizes your marketing strategy, and brings legitimacy to even the newest of businesses. A custom-designed logo ensures that your customers experience your brand from the very first moment.